With cameras currently rolling on Captain America: Civil War, the time has come to cast our eyes to it’s MCU follow-up, the Scott Derrickson directed Doctor Strange. 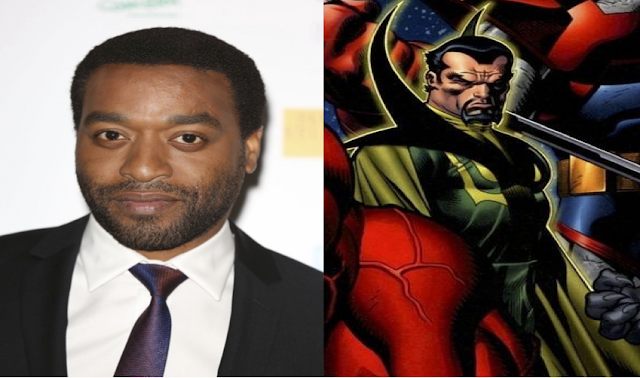 Deadline are reporting some really exciting news, with the Oscar nominated Chiwetel Ejiofor (Twelve Years A Slave) in talks to take the role of Baron Mordo, the similarly powered nemesis of Benedict Cumberbatch’s Master of the Mystic Arts. In the comics, Mordo was a student of master sorcerer The Ancient One (Tilda Swinton) alongside Strange, only to vow vengeance and turn to black magic after he thwarted Mordo’s plan to kill their teacher. But as we know Marvel Studios aren’t afraid to switch things up a bit (having already gender swapped The Ancient One), and the publication is also reporting that this take on the character may be different than the comics with this version of Mordo said to be an amalgamation of several character from Strange’s canon, and may not be entirely villainous, possibly being an ally for much of the film before turning evil at the end. Even though Ejiofor may seem like an odd choice for a comic book movie, considering his impressive caliber, but he’s no stranger to genre cinema, having absolutely knocked it out of the park as The Operative in Joss Whedon’s Serenity. The casting on Doctor Strange has been fantastic so far, and the more I hear the more my excitement grows for it.